I’m sure you’ve got it. A fumblerule is a rule that breaks itself; mistakes that call attention to the rule. 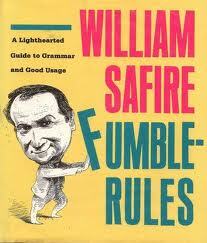 William Safire wrote a book in which he compiled a vast number of them. Here’s an amusing list of some which you may like to work through with your children if you homeschool – a fun way to look at common grammatical errors. Don’t use run-on sentences you got to punctuate them. Don’t use commas, which are not necessary. In the case of a report, check to see that jargonwise, it’s A-OK.
Here’s another one I read in the Readers’ Digest: Never use a long word when a diminutive one will do. Fun!